Quandong Blossom – Rare Fruit Society of South Australia Inc. The Quandong Santalum acuminatum is a small evergreen tree related to the Sandalwoods, native to the southern parts of Australia. It is a root parasite on other species, and thrives in arid areas on well drained, sandy/gravelly soils. Flowering is from late spring to mid-summer. 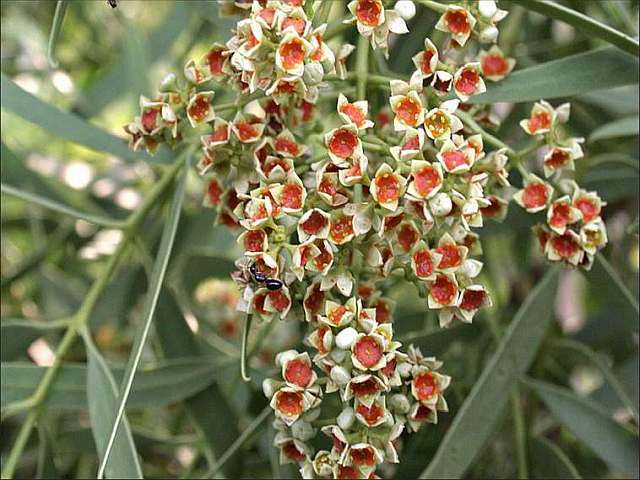 The small flowers, 0.6cm in diameter and borne in clusters, are light green to cream on the outer parts, with the centre generally a burnt orange colour. They are attractive to a number of pollinating insects including native and European bees, various wasp and fly species, and ants. Fruit ripens around August / September. The developing fruit is green or yellowish green, then turns bright red on ripening. A tree loaded with ripe fruit is a remarkable sight. The mature fruit are globular and vary considerably in size, from 2-4 cm diameter. It consists of a generally thin layer of flesh over a large, deeply pitted stone. Some selected varieties have a better flesh / stone ratio. Fruit can suffer rain damage, and infestation by caterpillars of Quandong moth Paraepermenia santaliella (Gaedike). The trees are relatively pest free but scale insects can be a nuisance. Psyllid species will sometimes infest the new growth. The fruit is used in pies, preserves and jams. The kernel within the stone is also edible.